Thirsty Pilgrim: Not Quite News, Saturday Morning Before I Go to the Beach Edition. Not Quite News, Saturday Morning Before I Go to the Beach Edition. The latest issue of Draft is out, including my non-expert-hey-I'm-just-a-tourist-here postcard from London. (What I saw: Plenty of young people and women drinking cask ale.) That's right: I'm not an expert, I'm a journalist. Which reminds me of John Kruk's famous line, "I'm not a athlete, I'm a baseball player." Anyway: I believe the same issue features a Chuck Cook exclusive on the secrets of Girardin, but I haven't seen the print version yet. Takes a while for the mail to get here. Also: I've updated the link to the Briggsian Belgian Beer Festival Calendar, there on the left. This weekend: the Weekend der Belgische Bieren in Olen. Finally: Moeder Lambic Fontainas is closing from Sunday to Tuesday this week for some interior redecorating... Specifically, they have decided to make those tables a bit more spacious and comfortable. They deserve much credit and silver for heeding the complaints of patrons. As an aside, when catering to beer lovers it's always a good idea to think large. 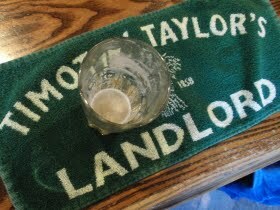 ...And you still find time to get a shot of a Taylor's beermat in! Good work! Leigh, it's easy to photograph a stationary Taylor's beermat in the wild. It's much more difficult to capture a full glass of Landlord (in my presence) because it disappears almost immediately. I went to Fontainas today. Was going to send you a picture of the changes, but they were´nt visible. You could feel them, though. They have taken away one table to make more room at all the others. As a result they have had to move every lamp, picture and loudspeaker. All this without leaving any marks. Great job (+ some work with the toilets and lighting behind the bar). A few days left to try the Swiss beers (April). I recommend the IPA Cask and the Bon Chien. May beers will be French or American? I know they're saving the American beers for July. I think French and German beers are coming up, not necessarily in that order. Ok. Sounds good. Speaking of American: following your tip I´ve been twice to the Hoppy Loft. It´s absolutely wonderful, some beers so hoppy it´s almost hard to breathe. I also like how they offer a set of three beers in smaller glasses "pour degustation". Moeder Lambic should do that too. Those 10 cl glasses (more like 15 cl) are an especially good idea for the stronger beers. I just don't need 33cl of imperial stout, but 10 or 15 cl is just about right. Echoing what Sven C said, the changes are not obvious but they are noticeable. Spent a while there today and the added room for legs is nice. Lets you spread out a bit more. The IPA Cask was top notch. Oh and from what I heard today, next month the special is German beers and then June for French beers. Then, like you said Joe, July for American ones.